The ISA Super Sport 121 yacht will be the first new model built by the Italian yard’s new owners, it was announced today (September 28) at the Monaco Yacht Show. Palumbo Group announced that it would be buying out the ISA Shipyard in July and the deal was finalised last month. The Italian yard added that the new 36.8 metre Super Sport 121 has been designed as a natural evolution of the popular ISA Sport series, which has spawned 11 hulls. 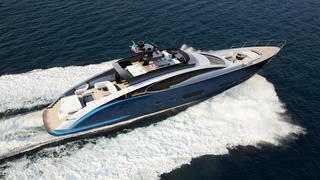 The Super Sport 121 will be built from a composite hull and superstructure at Palumbo Group’s Ancona facility. Marco Casali’s sporty exterior design features flowing lines and a sharply raked prow. Key features on board include a superyacht spa pool on the aft deck and another pool on the foredeck, both of which can be covered by removable biminis. Moving to the upper deck, and the seating area to fore can be shaded by a retractable hardtop. No further details have been revealed at this stage, with the total amount guest and crew accommodation unclear for now, but Palumbo Group added that it plans to introduce a larger ISA Super Sport 141 range as well. Other projects currently under development at the Italian yard include the Columbus Oceanic 70, which is one of the world's largest yachts being built on speculation.